The Charlotte Chorale under the direction of Dr. William Dederer. Razzmatazz and All That Jazz! The Charlotte Chorale once again brings to life the by-gone era of Hollywood and Broadway musical extravaganzas by performing select melodies from award winning stage and screen productions. “Puttin on the Glitz” will be the final concert performance by The Charlotte Chorale for the 2018-19 Season with a celebration of the all glitz and glamour from the grand musicals that made Broadway and Hollywood the crown jewel of entertainment. This was a time when black and white films burst gloriously into larger than life Technicolor and sad times turned to happy times with whimsical musical numbers from “Guys and Dolls,” “The Wizard of Oz,” “South Pacific,” “Forty-Second Street,” “Cats,” “Annie Get Your Gun” and many more. Singers and dancers swept us away for a few short hours to another time and place where dreams really do come true. 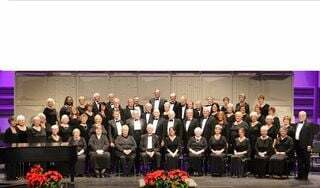 The Charlotte Chorale celebrates 30 years in Charlotte County with the 2018-19 Season, and for the past five years under the expert direction of Dr. William Dederer. The 70 voice community choir will be accompanied by local musicians to bring a fuller experience of the timeless music of stage and screen to the audience. The “Puttin’ on the Glitz” concert will be performed at 4 p.m. on April 13, at the Charlotte Performing Arts Center, 701 Carmalita St., Punta Gorda. Reserved seat tickets are available at a price of $25 for adults, $10 for students and can be purchased by calling 941-204-0033. Visa/Mastercard accepted. The Charlotte Performing Arts Center in Punta Gorda has ample parking and is handicap accessible. INFORMATION: Reserved Seat tickets are available at a price of $25 for adults, $10 for students and can be purchased by calling 941-204-0033. Visa/Mastercard accepted. The Charlotte Performing Arts Center in Punta Gorda has ample parking and is handicap accessible. For more information about The Charlotte Chorale please visit www.charlottechorale.com.